Virtual reality isn't just for gamers – standalone headsets could soon be one of the main ways we interact with the web, alongside touchscreens and mice. 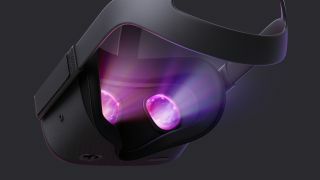 At its annual Oculus Connect conference, Facebook announced Oculus Quest – a new headset expected for release in early 2019. Oculus Quest will be priced at a relatively affordable $399 (around £300, AU$550), making VR more accessible to people without a powerful PC. The Quest premiered alongside a raft of new games, but at a pre-launch event in San Francisco, Oculus co-founder Nate Mitchell explained that although games are a major part of VR – and essential to taking it mainstream – other experiences make up about half of the content available for its Oculus right now. That's a surprising statistic considering the emphasis headset manufacturers place on gaming, but it includes a wide range of apps such as training simulations, creative apps (like Tilt Brush) educational tools, and web browsers that have the potential to shine a whole world of VR content onto users' eyeballs. Last month, Mozilla launched Firefox Reality – a browser for mixed reality (both VR and AR), and according to Andre Vrignaud, head of mixed reality platform strategy, the early response has been beyond Mozilla's expectations. "Initial downloads were likely assisted by being features in app stores, and feedback has been really positive," he told TechRadar. "We’ve received some great ideas on Twitter, Reddit, and our Github repo, and are working on our 1.1 feature list as we speak." Firefox Reality isn't the only virtual reality browser on the block, but Mozilla is the first of the mainstream browser developers to launch a whole browser specifically for the medium. To create it, Vrignaud's team had to re-think every part of Firefox, including text input, environment and search. He's reluctant to speak for the whole team, but says many really like the window resizing capabilities, while others are passionate about the content feed. "If I had to pick one area that seems to get the most love it’s Voice Search," he said. "I see people using that regularly all the time, not just to do traditional searches, but as a shortcut for navigation." Much of Firefox's appeal comes from its huge array of user-created extensions, and that's something Mozilla is hoping to extend to Firefox Reality – building up the VR web in the process. It's also working directly with hardware providers about the future hardware and software innovations they'd like to see become part of the web, and helping develop the WebXR standard. This is the successor to WebVR (an open standard that lets developers create virtual reality experiences for the web) with added augmented reality capabilities. "We regularly work with different partners who wish to bring content to the web as part of our ongoing web platform investment activities," said Vrignaud. "We look forward to those partners announcing their products (as well as highlighting some of them in the content feed!)" The virtual web is still in its infancy, but as standards are established, developers will be able to bring their content to a wider audience, making them available across platforms. Firefox Reality is very much a work in progress, but a fascinating insight into things to come.